What does a fairy tale wedding look like in real life? Wanna find out? Have a look at the wedding packages below. We only share these because you had the sense to snag our uplights at the best price ever and you know a great deal when you see one. Well these themed packages are a great deal and this is your ONLY chance to get em’ on sale this low. Click on the themes below to find your dream theme.. Cool, but what’s it come with? The uplights you ordered are great, but there’s only so much they can do. But what if you could get all the lights you need for the ultimate perfect theme in one single package. And what if it was less than half of what they’re normally worth? 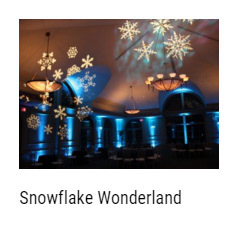 Themed packages come with all the lights you need to completely transform your room. We’re talking lasers, strobes, uplights, foggers and more! Everything you need to create extraordinary effects just like the pictures below. Remember all those dreams you had about your perfect wedding? Which theme should I choose? We have tons of themes to pick from and the three on this page are the top choice by our most loyal customers. 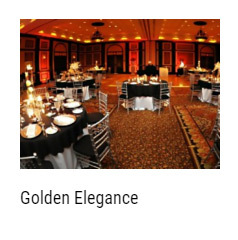 Whether you want beauty and elegance, posh luxury, or a full-blown rave we’ve got you covered. Is the most expensive theme the best? That really depends on you. We’ve slashed the prices in half but some themes are more than others because they take more equipment to create the right effect. What’s most important is that you choose the theme that’s right for you. When you close your eyes and imagine your perfect wedding what do you see? Choose the theme that’s closest to that and we guarantee you’ll pick the right one. Here’s some more pictures to help chose the one that’s right for you. I don’t think I can set this up… No sweat we’ll help with that too and it’s included in the package. 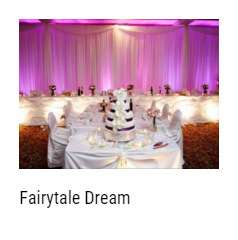 The uplights you ordered earlier are self pickup/setup but when you choose a themed wedding, we send our professional experts out with everything you need. Plus we set everything up for you exactly how you want so you really don’t have to do anything other than kick back and let your inner vision be our guide. It seriously doesn’t get any easier than this. Weddings are stressful and you already have so much to think about. Why not let us carry some of the HUGE burden for you? 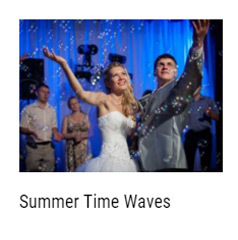 Themed weddings come with all of the lights and effects machines you could possibly need and it’s all done for you. Everything is tested to make sure you have the fairy tale setting you dream of. It’s delivered and picked up for you and you always have the final say. It’s just one more way to show our support for your very special day. In the end the choice is yours. 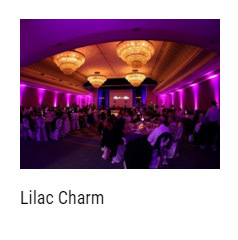 The uplights you ordered can light up individual focal points. But what about the rest of the room? Take your time and consider it and decide now before your order is completed. It’s your day and it only comes once. Shouldn’t you get exactly what you want? 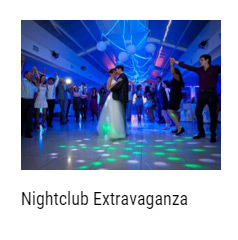 So click on your favourite theme then click ‘Book Now’ to Upgrade from the $50 Uplight Package to the Theme of your choice then proceed to checkout. P.S. Rates for this deal are based on standard delivery within 7km distance and normal business hours of 9am to 5pm Monday to Saturday, excluding public holidays. Please let us know your venue and time requirements to ensure you receive the most accurate costing. Effect photos & videos are shown as examples and can be modified to meet your needs. Hires are subject to availability so please check with your local store for specific dates. If you’d like an operator on-site to control lighting & fog equipment, or to make other lighting adjustments throughout your event, please let us know so we can give you an accurate quote.